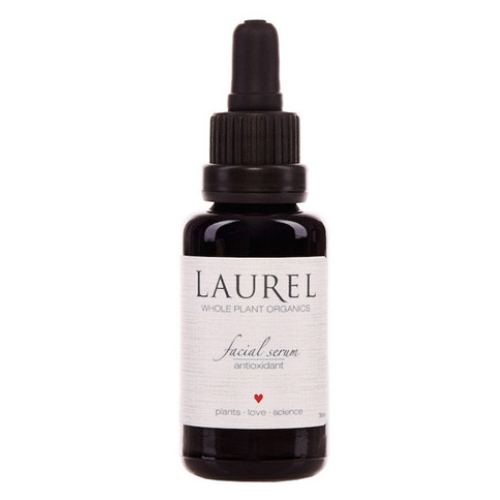 Completely organic from start to finish, the Antioxidant Facial Serum by Laurel Whole Plant Organics is a luxurious serum loaded with plant based antioxidants that effectively moisturize, while giving skin a regenerated feel and a sense of protection from free radical damage. This organic facial elixir features a luxurious cocktail of raw, organic, locally sourced, handcrafted, made-with-love ingredients including rosehip, cranberry and red raspberry seed oils, rose and jasmine essential oils and Laurel’s own biodynamic ‘house blend. A little of this beauty must-have goes a long way: It takes only a few drops every day to gain visible results. Formulated for a non-greasy feel, and compatible with both moisturizers and makeup, this ultra-pure serum addresses the overall condition of the skin. The bonus? The pleasure of its subtle but transporting fragrance makes any skin ritual that much more full of life. Three drops will ‘dew’. Squeeze serum into palm then dip index finger into the ‘pool’ and gently tap serum over cleansed and still moist face. Gently massage into skin.